Service-based learning experiences have long been appropriate for library and information science . This is especially true for reference classes where students must acquire both knowledge of hundreds of sources and strong interpersonal skills in order to interact successfully with library patrons. Coursework in library use instruction further extends this curricular responsibility by giving students the opportunity to explore the application of learning theories to the information professional's role in teaching library skills. This article documents how students in the "Library Instruction and Information Literacy" class in the Graduate School of Library and Information Science at the University of Texas at Austin incorporated a service-based learning model drawing on indigenous learning styles to create a virtual library for students and educators at a tribal college. In the Spring of 2001, the "Library Instruction and Information Literacy" (LIIL) class in the Graduate School of Library and Information Science (GSLIS) at the University of Texas at Austin (UT-Austin) designed and constructed a virtual library site (see <http://www.gslis.utexas.edu/~vlibrary/>) for the Northwest Indian College (NWIC) teacher training program, Oksale. The twelve graduate students in the LIIL class had completed the prerequisite class, "Introduction to Information Resources and Services" class and possessed varying levels of technical expertise. To gain a better sense of the needs of a Native American educational institution and the learning styles of Native students, the class studied the theories of Native American educator, Dr. Gregory Cajete. Cajete's writings became not only a foundation of the Web site but also a model for the class. Cajete's model provided LIIL students with a self-assessment tool as well as a device for presenting themselves and their work to the world. It fostered a work environment based on respect and collaboration. Using the model, students assessed their beginning skill levels and acquired new skills (their true faces). They witnessed their ability to constructively interact to produce a new Web-based environment (their true hearts). They affirmed their potential for contribution in a meaningful way to their new profession (their foundations). This article describes Cajete's model and ideals and shows their application in the Oksale Virtual Library Project. Indigenous people often employ the circle shape in ceremony and celebration and use it to illustrate a cultural worldview that is interdependent and cyclical. Cajete's model uses a ring of circles to describe the educational process. The cycle begins and ends with the learner and describes seven stages through which this individual moves. Some stages (e.g., Asking and Making) are common to many models. Others, like Being and Celebrating, are nearly unique. Figure 1 illustrates the seven stages in Cajete's model. The model provides the broadest possible view of the educational experience. It could apply to an entire degree program, a course, or a project within a course. At any stage, the path recreates itself in an overlapping array of iterations. For example, the process of creation, analysis, and revision that accompanies all projectsespecially all Web projectsoccurs frequently as epicycles within the large cycle of the class. If an attempt were made to chart every step of an educational process, many of these epicycles upon epicycles would be needed to make sense of the experience. Being is where the journey starts and ends. Being encompasses the knowledge, talents, and experience of each student as well as the class as a whole. At the beginning, Being includes what the students have to offer; at the end, it includes all the lessons the students learned in the class. Being is a basic orientation point that starts with the individual learner. To begin this cycle of self-exploration, the GSLIS students completed the Kolb Learning Style Inventory , a learning styles assessment tool. Through the test's self-identification categories of Accommodator, Diverger, Converger, or Assimilator, the students came to understand that although each person has a preferred learning and teaching approach, each person must also realize balance in a cycle of learning that includes concrete experience, reflective observation, abstract conceptualization, and active experimentation. Throughout the semester, LIIL students also interpreted their actions according to Cajete's "Cardinal Orientations of Indigenous Creativity" . Students spontaneously adopted one or more of four roles. One student was the artist/poet or the creative voice for the class. Several students were consistently the warriors/hunters or the risk-taking promoters of action, although sometimes other students adopted this role when the situation warranted it. Students who provided essential insights assumed the role of shaman/priest, and all students exhibited signs that they were philosophers/teachers, demonstrating "inquiry, scholarship, accumulation of knowledge, and further reflection on the metaphysics of the work to be done" . The stage of Being is represented on the Web site in the students' autobiographies. Each student had the option to present himself or herself culturally, and by learning style and cardinal orientation, specific content contributed, and/or technological applications utilized. "Asking is the initiation of a creative flow of thought. It is a place of first insights, intuitions, encounters, and experiences" . Asking is perhaps the most basic action in education: it is the realization that the learner requires something extra to grow and progress. For the LIIL class, Asking began when the students were given the assignment of designing the Oksale Virtual Library. In the first few weeks of the semester, they studied educational models and examined education and library instruction standards and guidelines in order to gain a sense of which questions would be effective to ask. Like the other events in the Cajete model, Asking was revisited numerous times during the construction of the virtual library. "Seeking is the actual process of questing. � In our seeking we begin with what we know, but we come to realize that it isn't very much. � We experiment; we learn again how to listen, how to observe, how to be humble, and how to find and ask for help" . Once the question is formulated or the project begins to take shape, it becomes possible to look for information from each other, from the client, and from the greater world of available resources. In a project that involves direct contact with a Native community, it is also imperative that all actions, including Seeking, follow a respectful protocol. While the LIIL professor is Native, her people are Anishinabe, a group quite distinct from the Lummi for whom the Oksale Virtual Library was being designed. She, along with her students, had to be attentive to cultural differences in communication. LIIL students, for example, had to temper their desire for information with patience. Queries to the end-usersthe tribal college students and facultywere structured to reduce the burden on the respondents. Communication methods included videoconferences, email, a trip by one LIIL student to a planning meeting in Portland, Oregon, and a visit by another LIIL student and the teaching assistant to the Lummi reservation. "Making involves the act of creating something new as a result of one's visioning" . Making can be physical: the creation of a paper, artwork, Web site, or presentation. It can also be purely mental: the linking of ideas into a new whole. LIIL students created the Oksale Virtual Library by offering content through a culturally responsive design. 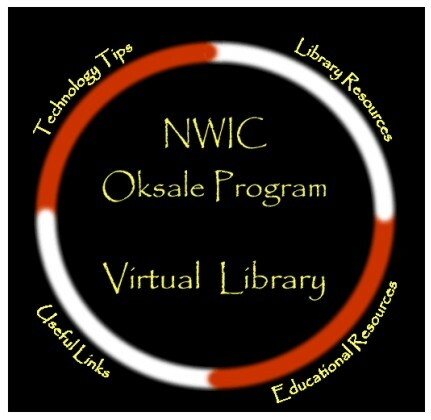 The content focused primarily on the needs of students attending NWIC in the Oksale program. Education Resources included original pathfinders on topics such as "Native American Language Revitalization" (prepared by GSLIS students from other courses), links to resources on developing curricula for Native students, lesson plans on the Web, and resources for children and their caretakers. Technology Tips included original handouts on learning technology such as Flash Animation and PowerPoint, with a glossary defining technical terms. Library Resources included links to ready reference sites. Useful Links provided links to sources related to grants and accreditation of institutions of higher education. Having means "we learn what our vision and creation mean, and what our inherent responsibilities are in relationship to them" . Having is best explained as understanding or internalizing the information and experience of the educational cycle. As the LIIL class came to the end of the Oksale Virtual Library creation process, the students considered what the completed Web site represented, what they had learned, and what each of them had brought to the project. The students submitted a 750-word reflective essay describing their contributions to the Web site as well as their comments on the process. Many started by providing a listing of the skills and competencies they brought to the class and assessed the new skills they acquired. "I really sprinted up the learning curve during this section of the library's creation and I am grateful for this opportunity where I expanded my web-building abilities" (from a student reflective paper). Others described their contributions to the development of the community of learners within the LIIL class. They provided examples of their contributions to the developing group process and how they worked with, and mentored, others. "Building the virtual library taught me much more than how to manipulate software applications; it taught me to listen to people and to keep others' wishes ahead of my own as I created a work that was not for me alone. . . . Now, I am truly invested in my and my classmates' creation and am proud of my work" (from a student reflective paper). Some connected the experience of creating the Web site with personal growth, showing that the modified Cajete model helped them come one step closer to being fulfilled in their professional and personal lives. "I am emerging from this class with new experiences, skills, and interpersonal connections. At the center of my being, I have changed for the better, and created out of this experience a fuller understanding of life. As I apply the skills I have learned and new experiences to other aspects of my life, another cycle will begin" (from a student reflective paper). "Our group came together and negotiated a large project that will have a life beyond our class, and it thus stands in my mind as a singular event in my library school career" (from a student reflective paper). "Sharing is the connected ring through which our vision becomes a part of the life and spirit of the community. � Sharing may involve a diversity of forms and dimensions. Sharing, in this stage, is essentially teaching others what we have learned. . . ." . "Each person evolves their own personal mythology and perceives and acts through the lens of that myth of self-creation. In the process of learning and education, one's personal myth intertwines with a group myth that has been elaborated to preserve that group's way of life" . Knowledge for its own sake has little place in Cajete's model. Only when knowledge is passed on or encourages other learning, action, or interaction is the full potential of education realized. LIIL students honored their work by sharing the Oksale Web site through formal and informal presentations and published reports. This level of sharing also created a balance of reciprocity as students could list these presentations and events on their resumes, providing further documentation of their involvement. Two students presented a poster session at the American Library Association (ALA) 2001 Annual Conference in San Francisco. Another pair gave an oral presentation to the Fall 2001 GSLIS Advisory Council. The professor made presentations at the 2001 Sequoyah Research Symposium and at the Association for Library and Information Science Education (ALISE) 2002 Conference. During the summer following the debut of the Web site, one of the twelve LIIL students entered into an individual studies course with the LIIL professor to prepare manuscripts for journals whose audiences included tribal college faculty, staff, and students, information professionals in library instruction, information professionals serving as education subject specialists, and others interested in Web tools, library instruction, or indigenous education. As a result, in the fall of 2001 short articles appeared in the Tribal College Journal of American Indian Higher Education and the Texas Library Association Library Instruction Roundtable Newsletter. A longer article that describes the Web content in detail is forthcoming in Education Libraries [14, 15, 16]. The virtual Web site itself is very much a product of Sharing and a vehicle for further Sharing. In fact, this article is also part of the Sharing stage. By reading it, the viewer becomes part of the Oksale Program Virtual Library's extended community. "Celebrating is a natural outcome of spiritual sharing, and it too can take a diversity of forms. � Celebration is a way of spreading the light around" . Too often in the educational process there is no point where the participants, students and teachers, take stock of their work and say that it is good. Cajete's model, with its focus on the development of the individual rather than the information and skills imparted, insists that this stage is vital. The LIIL class experienced the Celebrating stage with a brief ceremony and a potluck lunch on the last day of class. This gave the students and the professor a chance to informally discuss the project, identify places where future classes could improve and add to the virtual library, and share thoughts about how the project had affected the participants and how the skills and experiences of the project could form a foundation for future work. Being is the last step on the path as well as the first. Life, in the Cajete model, is a spiral. Each "educational journey" returns a student to himself or herself with new experiences, understanding, and insights. The students from the LIIL class carry with them the lessons of the project. The Oksale Virtual Library interface design reflects and assists the Cajete model. It acknowledges Being by realizing that the users of the Library are overwhelmingly Lummi. The Lummi people, known also as the Lhaqtimish People or the Saltwater People, live in northwest Washington State. Their reservation occupies a triangular seven-square mile peninsula off Bellingham Bay. It is a land of blackberry brambles, tall cedar trees, snow-covered Mount Baker, and the nurturing presence and bounty of the ocean. The design of the site (see Figure 2) used traditional Lummi colors (black, red, white, and yellow) and images (raven, frog, eagle, and salmon) to increase users' familiarity and comfort with the site. Asking and Seeking activities are seen in Web site content areas, notably the pathfinders and the technology handouts. Most of these electronic documents appear in the format of questions with corresponding answers. For example, Web site users find the question "What is HTML" on the Basic HTML handout and a corresponding answer. Asking is also seen in the feedback form, linked from the project sitemap. Making, Having, Sharing, and Celebrating are the stages of the individual's use of the materials in the Oksale Virtual Library rather than functions provided to the seeker. However, the multiple formats for features (list of links, PDF and HTML versions of the "Tech Tips" handouts) make the information easy to adapt and share. The structure of the site minimizes searching, allowing users to gain the most information in the least time. At every stage, the needs of the user were considered and respected. Cajete calls on educators to "engender a commitment to service rather than competition, promote respect for individual, cultural, and biological diversity, and engage students in learning processes that facilitate the development of their human potential through creative transformation" . While this call is challenging, the Library Instruction and Information Literacy course demonstrated that it is possible to successfully incorporate Cajete's model of indigenous learning in LIS education. 1. Roy, Loriene, "Service Learning," In Hagedorn, Linda Serra, ed., Sound Instruction: Ready to Use Classroom Practice (Chattanooga, TN: Rapid Intellect Group, 2001), 229. 2. Cajete, Gregory. Look to the Mountain: An Ecology of Indigenous Education (Durango, CO: Kivaki), 23. 4. Svinicki, Marilla D. and Nancy M. Dixon, "The Kolb Model Modified for Classroom Activities," College Teaching 35 (1987): 141-146. 12. Cajete, Gregory, Igniting the Sparkle: An Indigenous Science Education Model (Skyand, NC: Kivaki,1999), 92. 15. Roy, Loriene and Aimee Akerman, "UT-Austin Class Implements 'Virtual' Library," Texas Library Association Library Instruction Round Table Newsletter (Fall 2001): 2, 4. 16. Roy, Loriene and Aimee Akerman, "OKSALE: Building a Culturally Responsive Virtual Library of Education Resources for a Tribal College," Education Libraries [forthcoming].